The Old Village of Hollókö and its surroundings is a living example of rural life before the agricultural revolution of the 20th century. It developed mainly during the 17th and 18th centuries. Hollókö is an Palóc ethnographic village, an ethnic minority group in north-east Hungary. Hollókő is a Palóc ethnographic village in the northern part of Hungary. It can be visited as a day trip from Budapest – there are two buses a day leaving from Stadion bus station (metro station: Puskas Ferenc Stadion). The mornig bus leaves at 08:30 and it takes two hours to get to the village which is hidden somewhere at the end of the road in one of Cserhat mountains valleys. Then you’ll have 5 hours and a half there, ‘cos the returning bus is at 4pm. You have plenty of time to see everything in the area – walk back and forth the two little streets, visit the church that was reconstructed in 1909 after the fire, visit all the museums in the village (village museum, dolls museum, post museum, weaving place, craft shops – for all of them you have to pay a minimal entry fee), follow the educational trail and learn about the local nature and local way of life, climb to the (partly reconstructed) 13th century castle for nice views, although the village itself cannot be clearly seen because of the forest that surrounds it (photo). There is a new Tourist information centre at the entrance to the village, close to the parking lot, just behind the cemetery where you can get a map and some leaflets about Hollókő and activities and feasts in the area. At the end of your tour you can have a local meal in one of the restaurants (there are at least three of them) – do not miss paloc soup! Hollókő is much more prepared for tourists than Holašovice or Vlkolínec, also WHS in Czechia and Slovakia. I cannot even imagine spending four hours in Holašovice where almost everything is closed even during summer. In my opinion the biggest value of Hollókő is that this village is a kind of an enclave of originally Altai/Turkish speaking people who appeared in northern Hungary in 13th-14th centuries and were able to keep their tradition and way of life for such a long time, although they forgot their mother language and partly assimilated (religion) to their new homeland. They created a kind of small architecture which is really unique. 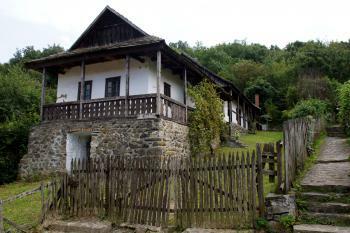 Hollókõ is a fine example of vernacular architecture, which has remained virtually unchanged for centuries. Although the village was burned down several times, it was always restored in the style of the 17th century. Only after the last large fire in 1909 the thatched roofs have been replaced with tile roofs. The old village consists of about 60 residential houses with farm buildings and a small parish church, the modern village is right next to it. The single long street forks at the small church creating a lens-shaped "island" in the middle of the settlement. The plastered half-timbered houses have a stone base and most of the houses have overhanging porches and galleries or a veranda on the street side. The photo shows a typical example. The architecture is similar to the houses in Vlkolínec (also a WHS), but Hollókõ appears more elegant due to the white-washed walls and the verandas. 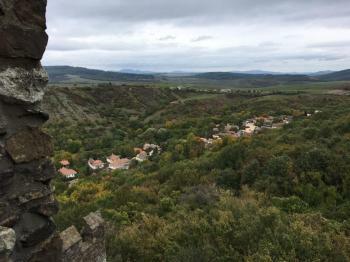 Another difference to Vlkolínec is that Hollókõ is more developed to tourism, there are several museums, craftsmen exhibitions, a restaurant and facilities for accommodation. Most interesting is the Village Museum (Falumúzeum), where the traditional interior layout with three separate rooms and historic furnishing can be seen. 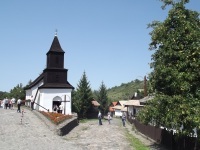 Fortunately it was not too busy when we visited Hollókõ on a weekday in August 2014, there were only about ten private cars in the parking lot and about thirty visitors spread over the village. But Hollókõ is a popular destination for group tours (it's just 100 km from Budapest), so it can be crowded in the peak season. We also went up to the castle, but it was closed for renovations. I don't think that we have missed much, it does not look particularly interesting. Actually we climbed the hill for a view of the village, but it is hidden behind trees and the hill. Maybe the view from the castle tower is better. Back at the car park we noticed two large tour buses – and we were happy with our perfect timing. It is a matter of taste whether you prefer Hollókõ or Vlkolínec, we visited both on our trip and I liked them both. There are not many villages in Central Europe that entirely have been preserved in their historic structure, and only a few of them are World Heritage Sites. A very tidy village full of traditional architecture and a few villagers selling handicrafts. I reached the site by bus from Paszto station. Paul will be relieved to know that there is only a small car park up the hill from the bus stop. There is one restaurant, and a handful of the houses offer accommodation. Holloko in Hungary is a very charming, well-preserved old world village. It welcomes visitors and tours of the village are available. Our group was invited to a local home for lunch and the owners were a wonderful older couple who obviously were very proud of their home and garden. It was a delightful afternoon and I would heartily encourage tourists to take this excusion and see the wonderfully preserved wooden houses. We were on an organized tour from Budapest and were so happy to have had this experience. Went with three Hungarian friends as a day trip from Szolnok. Weather was clear and the village was quiet. The wooden houses are really beautiful and well-preserved. When we visted the castle on the hill, we met several groups of very young students, obviously on school trip. Back in the village, check the souvenir stores for ceramics. They are reasonably priced and pretty. The preserved village of Holloko is set a convenient return day trip’s distance from Budapest. When we visited it in 1986 towards the end of the communist era it was certainly very “pleasant to the eye” but we didn’t find the visit that satisfying. The site is so much more than just a street of pretty wooden houses with a church at the end. The local “Palosz” people ignored agricultural and social changes going on elsewhere and in so doing “preserved” not only the buildings but a way of life from the 18th and 19th centuries. The site includes all the surrounding lands with their multitude of uses and where these were lost, such as with strip fields, they have been restored . However, whilst communism sat less heavily upon Hungary than on many Soviet satellites, everything in those days was organised for group tourism, often under the pervasive banner of IBUSZ the “Intourist” of Hungary. So this museum village with its old fashioned rural atmosphere was organised for coach parties who were given a quick walk round, a visit to the church, a Hungarian meal at “the” tourist restaurant and a bit of “folklorique” from locals dressed up in Palocz costume. We were self driving around Hungary and had thought of staying overnight at one of the local houses which acted as hostels in those days – but no one seemed interested in handling a couple of Western Europeans so we moved on (perhaps our lack of Hungarian or Russian didn’t help as we didn’t encounter many Western European language speakers!). There was also still an “Aliens Registration Form” which had to fully account for all one’s nights in the country (on pain of fines for any gaps) so self service foreigners not using IBUSZ or the tourist office were potentially “bad news”! I remember on one occasion after “complaining” about the emphasis on group travel being told that it was all the UK’s fault that Hungary was communist anyway as Churchill had given it away at Yalta! I wonder what the place is like today? In my mind I see a picture of privately run restaurants with tables outside the houses and guest houses all packed with tourists. There is probably a huge car park on the outskirts too. And, no doubt, the local costume is hyped up even more! Even if such changes have occurred I would recommend anyone travelling in Hungary to “take a detour” to visit Holloko. The WHS list doesn’t have as many European “vernacular” sites as it should. Such places will inevitably become tourist honey pots and I just hope that Hungary has exercised some control over untrammelled capitalism! It certainly promised to do so when the site was inscribed. Maybe it is better presented too and you can get behind the “top show” and understand more of the lifestyle which the village supported. From "Hollokö" to "Old Village of Hollókö and its surroundings"